Our dog Ellie passed away at age 14. 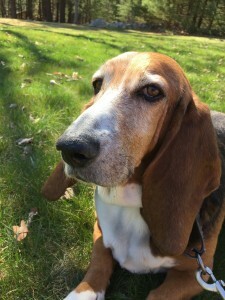 To celebrate her life, I want to share some stories about this sweet, smart Basset Hound. We met Ellie, at age 8, at a dog-themed fundraiser at our local library. At this “Woof Walk,” patrons gave a donation to walk their dogs around the fall foliage. A Basset Hound rescue had also brought dogs for adoption, including Ellie. My wife Ellen had always wanted a Basset Hound, and this one shared her namesake, so it was kismet. We brought along our beagle mutt Bentley to make sure he and Ellie got along. Happily, they hit it off. Despite Bentley being the bigger of the two, Ellie made it clear from the start: SHE was the boss. My daughter Olivia had to do a science experiment for school. She decided to explore, “Which of My Dogs Is Smarter?” She predicted that Ellie would win, paws down. Having seen Ellie’s wily ways in action, I had to agree. Ellie once swiped a loaf of French bread off a high counter. By the time I noticed, she had run into another room, meticulously removed the baguette from the plastic wrapping, and devoured it. To test her hypothesis, Olivia hid treats in my office, then called Ellie from a distant part of the house. In a flash, she raced up the stairs and sniffed out all treats. When she repeated this test with Bentley… well, let’s just say that he has other charms. Over the last few years, Ellie developed some odd growths. Our vet determined they were all benign. Then, about a year ago, a new growth appeared at the top of her front right leg. It resembled a mutant cauliflower. We asked about having it removed, but the vet said that since Ellie had a heart murmur, putting her under anesthesia was not wise. Still, Ellie continued to do all her favorite things—having her belly rubbed, stealing food, basking in the sun, and chasing Bentley. I suspected the end was near when Ellie stopped eating. She still wagged her tail but her energy level plummeted. I was cooking in the kitchen, when Ellie wandered over, and collapsed. In a matter of minutes, she was gone. We wrapped her body, and played “Amazing Grace” on bagpipes on my phone, as we carried her to our unheated garage, a few minutes from our house. When our previous two dogs had died, it was during the summer or fall, so I had no trouble digging their graves in the woods on our property. Since it was winter I thought that we’d have to cremate her remains. But Finian, my brawny 18-year-old son, was determined. It took him a few days, but he dug her grave. We buried her wrapped body, and covered it with heavy rocks. As putrid as Ellie’s “aroma” was during the last few months, I’d give anything for another whiff of her, as she strolls in the room. Rest in peace, Ellie. We’ll always remember you. This entry is filed under Catchall, dogs. Subscribe to the Comments RSS feed. What a beautiful eulogy. Thank you for sharing. We have a 12 year old orange tabby that adopted us in Germany. He’s enjoying his last days this year too. We had him in an oxygen tent at Memorial Day 2018 and knew we had, at most, 6 months. So all these days are bonuses, but our dinner conversation touches upon digging in winter too. Our 2nd kitty died a month before we moved from Buff to Dayton, so we agonized over where to lay Bobby to rest. We ended up burying him at Dad’s on Oakgrove drive ( but talked about transporting him to Dayton to bury him there…) we adopted him in Botswana and had him for 14 years, so he was a big ( and expensive) part of our family. These pets bring us such joy, and such sorrow when they move in to their next assignment. So sorry about Ellie’s last. Of time and your loss. You may recall that we had a basset hound Penelope, who was preceded by by Oliver Twist, and then followed when I was on my own by Molly. I have a special place in my heart for bassetts and well remember the sweet posts that you have put up about Ellie. May her memory be a blessing. Thanks, Mary. I do recall your fondness for Basset Hounds. I’m a sucker for any hounds. Thanks for your kind words. She was a charming dog, and we miss her. She had a rough last year, but I was always impressed with her resilience. Thank you for providing a loving and happy home for Ellie. We are truly grateful that you provided such wonderful care for her. It was a treat and honor to have her in our family.